Last year during a visit to Qingdao, China, we stopped off at a street fair to look around. 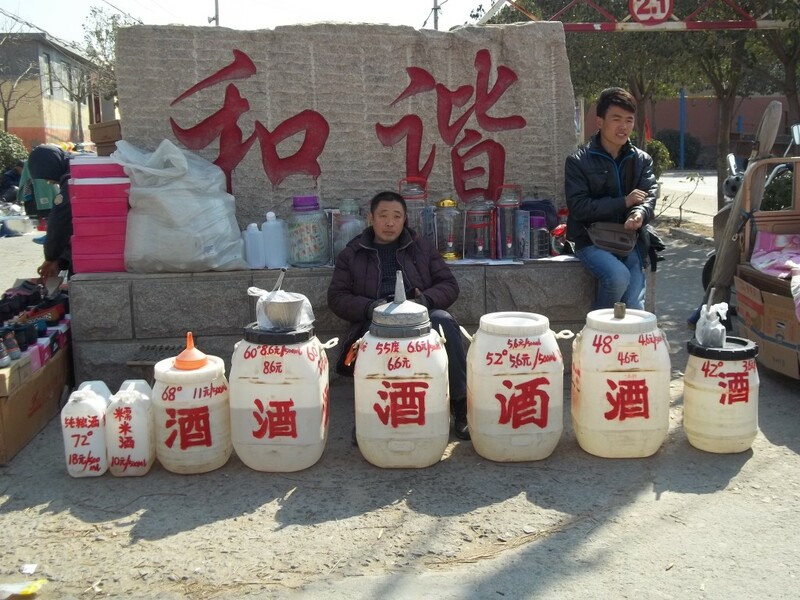 A couple of guys were selling liquid in the large jugs you see in the picture. I couldn’t resist asking what it was. My first guess was some sort of fuel, maybe gas or kerosene (note the large funnel on top of the container in the middle), but that wasn’t it. Turned out it was a food product. Maybe olive oil? That wasn’t it either. It was wine. That was the last thing I expected because I’ve always seen wine sold in glass bottles, not in bulk from large plastic jugs. I don’t see how the wine could stay fresh sold in large plastic containers out in the street like that, but hey, what do I know? There are many things I’ve tried in the past in China, but I’m still a little leery of buying food from a street vendor who may not have been processed his product in the cleanest facility, or used sanitary equipment. It’s one reason why we don’t source food products from China. In 2008 they had a big problem over there with milk and infant formula, where 54,000 babies were hospitalized and at least six infants died. China has plenty of world class manufacturing companies making high tech products like Apple’s iphones and ipads, and HP’s computers and printers, to name a few. Over the years we’ve sourced from many solid factories in China that make products from metal, plastic, wood, textiles, or other hard materials. China has become the go-to when it comes to sourcing hard products like these. They still have a way to go with insuring the safety of their food products , though. In fact, some of my friends over in China have asked us to send them chocolate before because the prices in the U.S. are better than what they can get in China, in addition to the quality. Hmmmm, maybe I ought to start a chocolate making factory in Colorado and start exporting it to China.